Children's Games and Toys, Puzzles, Gourmet Nuts, Chocolates & More! Tomie lives in our town and is a good friend of Morgan Hill Bookstore! We have "AUTOGRAPHED COPIES" of all of Tomie's books that are currently in print. You can also see Tomie's books on his website, at www.tomie.com. If you haven't visited this wonderful site, take a few minutes to go there! Tomie received the LAURA INGALLS WILDER 2011 AWARD FOR LIFETIME ACHIEVEMENT IN CHILDREN'S LITERATURE! AND Tomie's hometown of Meriden, Connecticut named their children's library for Tomie! Tomie continues to delight his fans with his newest book "Quiet". A great reminder to all about the importance of slowing down and noticing all that is around us by simply being quiet. We can design and ship a MORGAN HILL GIFT BOX for any occasion in any price range! You can now order these autographed editions using our nifty new shopping cart! Just go to the pull-down tab Buy Tomie's Autographed Books attached to the link for this page. As always, you can still give us a call at (603)526-5850 if you have any questions or if you prefer to order by phone. We normally have autographed copies of these book in stock, ready to ship within 24 hours. Prices quoted are for hardcover and paperback editions. If a single price is quoted, that is the only edition of the book available. 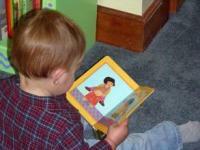 Board books cannot be autographed. Even indelible ink just rubs right off their shiny surface. 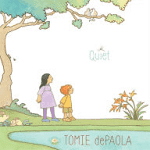 Note: Tomie's other video, A Visit with Tomie dePaola, is no longer available.